Sir you are no Khabib. Kind of shocked the first big near riot at a BJJ event was caused by Erberth Santos and not Dillon Danis. There has to be a way to blame all of this on Dillon Danis. Give it time. 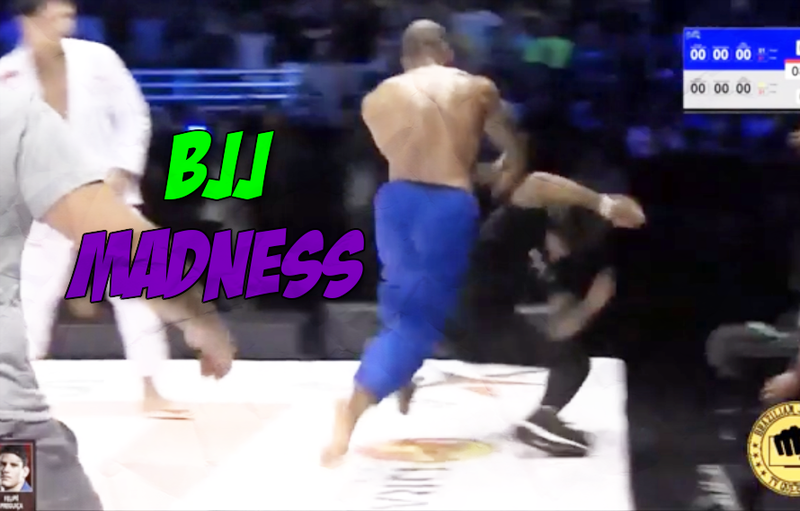 So apparently Erberth Santos lost his mind Saturday night in Brazil. On a scale of Strikeforce Nashville to UFC 229, the BJJ Stars brawl falls somewhere in between. Maybe because it’s hard to show off your ground game during a massive 50 person scrum. This is guaranteed to be the most strikes you will ever see thrown at a Jiu Jitsu event. It all began when Santos pretty much faked an injury to get out of a match. Paired with ADCC 2017 absolute gold medalist and IBJJF world champion Felipe Pena, Santos grabbed for his right knee. The mat side Doctor was called in to check on Santos. Then things got a little weird. Then Santos lost his mind and the rest is BJJ history. Somebody from the crowd or Pena’s corner started to talk smack to Santos while the doctor was examining his knee. Santos started to shout back. Then through the magic of modern medicine, Santos recovered and proceeded to bum rush the crowd. In the process Santos just truck sticks an innocent female bystander. Santos is briefly restrained then tries to attack more people, not one but at least two more times. Also pretty sure a few people eat some soccer kicks during the melee. And the video of the entire brawl from start to finish.